Additional Info: Our latest Top of The Range Holiday Home purchased Sept 2018, is very spacious being 40 x 13 with extensive wrap round decking and additional patio areas, ideal for relaxing and taking in the beautiful views across the tree tops. Woodland View is only 10 minutes level walk to the stunning clifftops of Milford On Sea. The beautiful contemporary interior of the Rufford Lodge oozes luxury with a very large sofa in the lounge which converts into a double bed, in addition the comfy armchair makes it the perfect place to unwind after your busy day, with our Smart TV and DVD player you have all your entertainment needs provided for. The kitchen has a side by side built in fridge & freezer, microwave and gas double oven, with plenty of cupboards including a "wine rack". Opening into the dining area with a free standing table & chairs this is perfect for preparing food whilst still engaging with your family/friends. 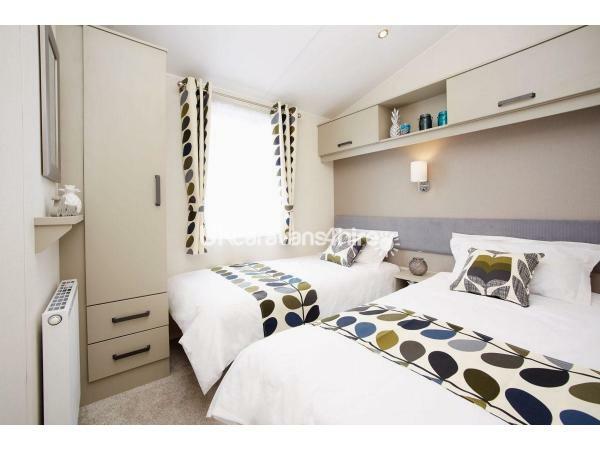 One of the great bonuses in this Luxury Holiday Home is the Utility Room ideal for storing those coats & footwear but even better you have a washing machine and more storage. The Master Bedroom is a generous size with King Size bed and overhead cupboards, dressing table and double wardrobe has the advantage of an ensuite with bath (ideal when you have very small children) and a shower overhead. We have provided a built in TV so no arguments over what to watch when the football is on! The second bedroom is more spacious than most with 2 full size single beds, wardrobe and shelves plus the advantage of another built in TV. The main bathroom with large walk in shower, has Jack n Jill doors so this can be accesses directly from the second bedroom as an ensuite or from the hallway, great with 2 couples are sharing the Holiday Home. We offer a personal customer service with a Meet & Greet Service by our Caretaker Lyn, who will familiarise you with the Holiday Home and is contactable throughout your stay with any queries you may have. We provide all your linen with beds made up prior to your arrival, in addition to towels and welcome items such a tea, coffee, milk, sugar and biscuits or cake and a complimentary bottle of wine or soft drinks to start your holiday off in the very best way .................. No need to rush out for those essentials on arrival, just chill out and enjoy. Contact us now for availability and excellent prices - We are currently getting a lot of enquiries for School Holiday periods. We look forward to hearing from you and providing you with the very best accommodation. T & C's apply. Deposit required £100 - balance of booking required 4 weeks prior to arrival. Refundable Security deposit of £100 required this is returned subject to checkout. Please include numbers in party and ages of children. Our Newest Holiday Home - we listened to feedback from our guests when purchasing this fabulous Lodge. Available from October 2018 our Brand New Atlas Rufford Lodge oozes style with its contemporary chic Orla Kiely design in the fabrics. Spacious but also practical with two ensuite bathrooms and a unique separate utility room with washing machine the perfect Holiday Home with luxury refinements throughout. The beautifully furnished lounge has a large L shaped suite which incorporates a pull out sofa bed and a large armchair. A Smart TV (free WiFi access) and DVD means your entertainment is fully catered for. The sliding double patio doors open onto a generous wrap round decking area which is furnished so you can enjoy that cheeky glass of wine or even dine al fresco. There is an additional patio area also with seating and a barbecue supplied to add to the fun. The stunning modern open plan kitchen is fully equipped and features a gas double oven, built-in microwave and side by side built in fridge and freezer units. With ample storage cupboards, shelving and even wine rack - its the perfect place to cook and entertain. An additional feature of this Holiday Home is the separate utility room complete with cupboards and washing machine and plenty of room for those growing number shoes and outdoor clothing (especially when the weather is a little damp). The themed furnishing continues into the Master Bedroom, again spacious and light complete with Kingsize bed, plenty of storage in the wardrobes and cupboards and dressing table with stool. 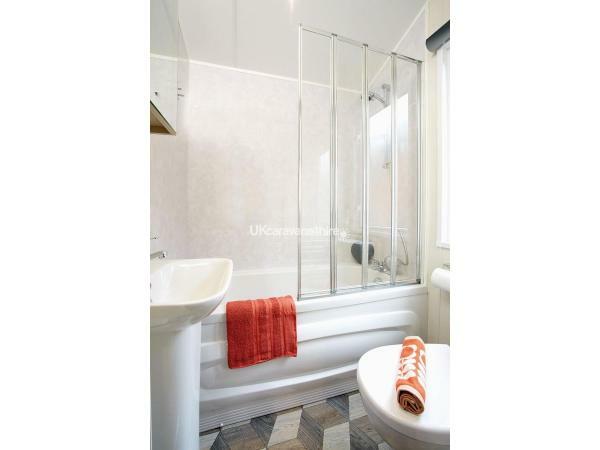 The ensuite bathroom features a bath with a shower over and screen, ideal when there are small children. You will find a TV with Freeview for those early nights or when there it is sport versus drama! The second bedroom is ideal for a second couple or children as the twin beds are full size singles and it features an ensuite bathroom with "Jack n Jill" doors from bedroom or into hallway. Again we have supplied a TV with Freeview. Our guests are really important to us and we want to ensure your stay is perfect, so we include in our prices all your bedlinen & towels and toiletries, together with our Meet & Greet Service from our Caretaker. In addition we include welcome items such as tea, coffee, sugar, fresh milk and the ever essential bottle of wine s you can chill and relax when you arrive. 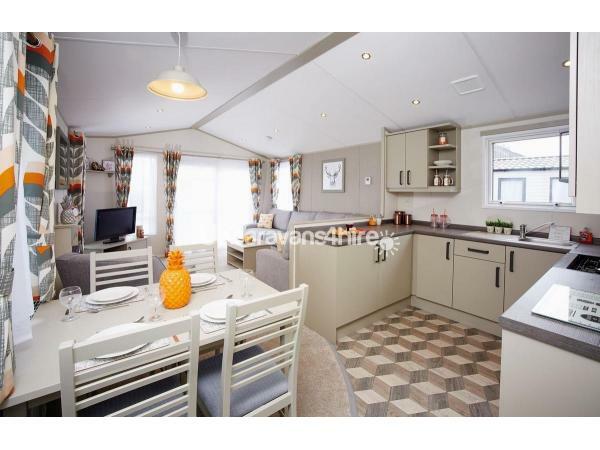 This is a beautiful Holiday Home with everything you could want for the perfect stay on this wonderful Park. WE CURRENTLY HAVE AVAILABILITY FOR OCTOBER HALF TERM & CHRISTMAS - BUT HURRY ENQUIRIES ALREADY COMING IN FAST!! !